The Republic of Estonia (Estonian: Eesti Vabariik) is a small Baltic country located in Eastern Europe. With a low population of 1.3 million, the former Soviet Republic that gained its independence on August 21st 1991 is now one of the fastest growing European countries. It has a high Human Development Index, Democratic government and is a member of both NATO and the UN. The capital city is Tallinn. Although it has a long history reaching back to the 10th century AD (CE), the nation has only had one previous (pre 1991) period of Independence. This brief period began on February 24th, 1918 when Estonia declared independence from the Russian Empire. At that time, the First World War was in progress, and Estonia needed a currency of its own. Foreign currencies such as German Marks, Reichsmarks, Russian banknotes, Roubles and Finnish Marks made up most of the circulating currency. Estonia's independence lasted for barely 22 years before its annexation by Soviet Russia in 1939 under the Molotov-Ribbentrop pact with Nazi Germany. 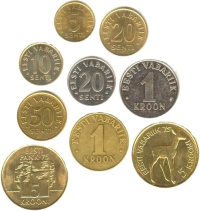 Estonia was numerously conquered over the centuries, thus there were many different coins used and minted throughout the ages, including some minted in Tallinn (Reval) and Tartu (Dorpat). It was decided to adopt the 'Estonian Mark' as official currency, a decision demanded by the German occupational authorities. 11 different Mark/Marka coins were issued between 1922 and 1928, but only 10 circulated: 1 Mark, 3, 5 and 10 Marka. All coins until 1925 were in Copper-Nickel. In 1926 they were in Nickel-Bronze. In 1926, almost all of that years' 10 Marka coins were melted before they came into circulation. Commemorative coins were issued: 1 Kroon in 1933 and 2 Krooni in 1930 and 1932. Note: Numerous banknotes and treasury notes were issued from 1919 to 1940 (Penni, Mark and Kroon denominations), and from 1991 to 2010 (Kroon). In addition to these coins, the bank of Estonia (Eesti Pank) has made many commemorative Silver, Platinum and Gold coins, many of which are on Numista and all of which can be found view on the Bank of Estonia website. The coin shown in the right is the 2010 Estonian 10 Krooni coin commemorating the Vancouver Olympics. Estonia has a habit of issuing a coin for each olympic games since 1992. In 2011, Estonia adopted the Euro as its official currency, but has continued to issue commemorative coins in Silver and Gold. 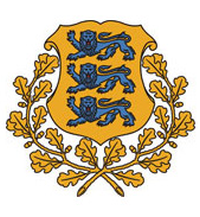 The coat of arms of Estonia depicts a golden shield, which includes three slim blue passant gardant lions with red tongues in the middle and golden oak branches along both sides of the shield. The lesser coat of arms lacks these oak branches. The three lions derive from the arms of Danish king Valdemar II who had conquered northern Estonia in 1219. Laan, Kaupo. Eesti Vabariigi Mündid ja Rahareformi Medalid. Tallinn by Kaupo Laan, 2012.